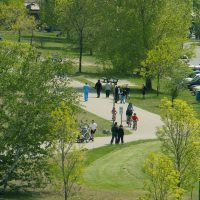 Hamilton Halton Brant boasts a diverse range of well-marked trails, paths, loops and routes for cyclists, with some of the most popular taking in beautiful waterfront scenery. Whether you’re travelling alongside or enjoying the view of the shores of the Grand River, the waves Lake Ontario or the wetlands of Cootes Paradise, we’ve got the routes for all types of riders. Pedal a portion of the Greenbelt Route, a 475 km signed road route that arcs above the Greater Toronto and Hamilton Area through protected land. The Escarpment Expedition portion boasts multiple water views. 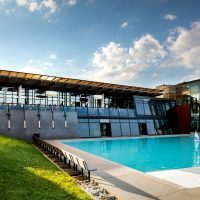 Riding through Ancaster and around Hamilton and Dundas, the route will take you down and up the Niagara Escarpment, along gorgeous winding roads, and right past the Christie Lake Conservation Area. Climb out of Dundas to the top of Sydenham Hill for a stunning view out over Cootes Paradise, the largest wetland at the western end of Lake Ontario, and Hamilton Harbour to the distant Niagara shoreline of Lake Ontario. Join the Chedoke Trail on a spectacular tour through lush woodlands and past numerous waterfalls etched out of the impressive shale and sandstone layers right along the trail. The HamBur Loop winds 50km through Hamilton and Burlington, offering recreational cyclists a great touring option for taking in some of the area’s most stunning waterfronts and scenic lookouts. Bicycle friendly restaurants and hotels are conveniently located right on the route, making it easy for the not-so-serious cyclist to explore the area over a few days at a more leisurely pace. You’ll cycle alongside the shores of the Grand River as part of a trip on the Hamilton to Brantford Rail Trail. One of the best rail trail networks in Ontario, it travels between Hamilton, Brantford, Cambridge and Port Dover. From Hamilton, pedal the trail through conservation and agricultural lands for 32km to Brantford. Continue to follow the trail and Grand River north 14km, connecting to Paris and on to Cambridge. A scenic, paved off-road portion of the Waterfront Trail follows the shoreline between Burlington and Hamilton. With plenty of parking available at either end, this ride is easy to access and fun for all ages. Stop at sandy beaches and playgrounds along this 10km stretch or watch the big boats glide under the lift bridge before getting the whole gang drenched at Wild Waterworks. Hit Hamilton’s waterfront for some two-wheeled family fun. 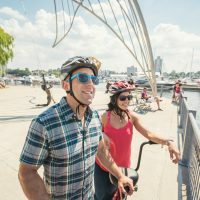 At Waterfront Wheels, you can rent 2 and 4-seater surrey bikes or tandem bikes to explore the shore, stopping for ice cream or even a spin on the outdoor roller skating rink. If improving time and speed are your cycling goals, then put the Lakeshore Fondo on your ride agenda. A classic Halton “big ride”, the Lakeshore Fondo is an exploration of both city and country. The 70km route takes you across the shore of Lake Ontario westbound from enchanting Oakville through the beautiful, lakeside city of Burlington. Enjoy the climb up the Escarpment into the beautiful Victorian Village of Waterdown. Head back to Oakville through the rolling rural country roads of First Line and Lower Baseline, two top favourites of cyclists in the area. Grab a bike to explore Hamilton, a city with a burgeoning culinary, music and arts scene. With a growing network of dedicated bike lanes, signed bike routes and off-road multi-use paths, cyclists of all ages can safely enjoy urban riding in ‘The Hammer’. A number of the city’s trails allow you to take in the views and attractions of one of North America’s most noteworthy harbours. 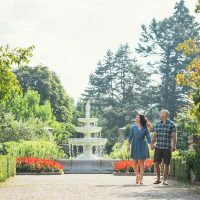 The 16 km Harbour and Lakeshore Route takes you past Burlington waterfront shops; the lift bridge, canal and lighthouse; Lake Ontario beaches and restaurants; and Confederation Park. 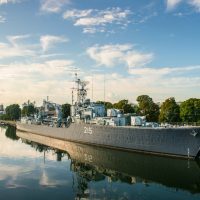 The 14 km Ferguson and West Harbour Route incorporates the Waterfront Trail and passes Bayfront Park, the HMCS Haida warship and Cootes Paradise. The Burlington Waterfront Trail takes in eight waterfront parks, beautiful beach, a vibrant downtown waterfront, and the pier and promenade. This trail splits into two sections at Maple Avenue and Lakeshore Road; one travels along the Beachway over the lift bridge, and the second follows the pretty residential North Shore Boulevard or Lakeshore Road. Park at Paletta Lakefront Park to start your ride. Take a break from the bike and add a canoe or kayak experience to your day. Paris is the perfect place to go from mellow trail riding to a Grand River rafting or paddling experience with Grand Experiences. After outfitting you with bike & paddling gear, your experienced Guide leads you up the trail from Paris to the village of Glen Morris. 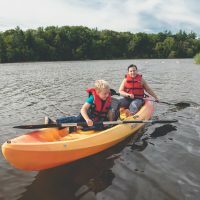 You’ll cycle along the riverside trail under a canopy or trees from the rare Carolinian Forest, then take your choice of canoe or kayak for a serene paddle down the Grand River back to Paris. Not just a buzzword, combining cycling with different modes of travel can be both convenient and add to your next bike adventure. GO Trains operate in and around the greater Toronto area, and you can take your bike on any train outside of rush hour during the week and on Saturdays. Take your Bike on the Go and cruise the Great Lakes Waterfront Trail starting in Burlington. Using Trail to GO signage, you can set off from the Burlington GO stations and ride south through downtown Burlington, towards Spencer Smith Park and the Great Lakes Waterfront Trail.Enjoy off-road paved riding out of Burlington for nearly 12 km before arriving in the village of Bronte. Stop for refreshments and continue riding east on a mix of road riding and off-road paths through residential areas and parks.You’ll arrive in the historic town of Oakville at approximately the 25 km mark, where you can cruise the downtown and visit boutique shops or grab lunch or a snack before setting off again. Whether it’s a lunch break or after the day is done, sitting on a patio listening to the lapping waves and sharing highlights of the day’s waterfront ride is a perfect way to unwind after any distance. Rooftop patios hanging over the Grand River make for an incredibly scenic stop when riding the rail trail between Cambridge and Paris. Don’t miss Spencer’s at the Waterfront after a ride on Burlington’s shore. Check www.bellhomestead.ca for updates on hours, days of operations, events and rates. Saturday tours with 3 pick up locations. 9:30 am from Toronto, 10 am from Oakville, 10:30 am from Hamilton.